*Saludos to those of you who also studied Walter Benjamin! 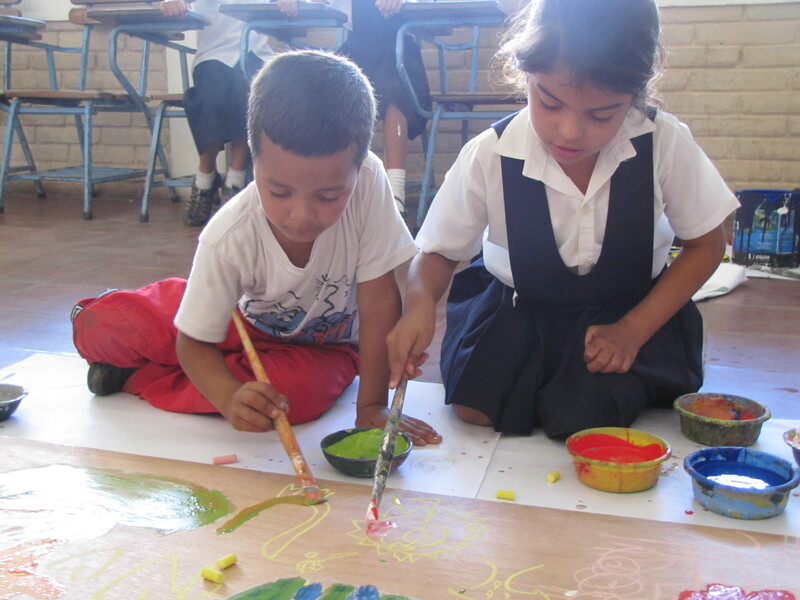 Primary school students paint side by side in a FUNARTE workshop. Confession: My internship with Pueblito is not the first time I participate in arts-based intervention initiatives. As an intern for a women’s shelter in downtown Montreal, I volunteered for biweekly painting workshops offered to the shelter’s residents and ex-residents. There, facilitators led reflexive discussions on a chosen theme (for instance, space—safe spaces, personal space, spaces our minds go to, etc), each woman was presented the option to decide whether or not she wanted use the theme as inspiration in her artwork, and we all painted together for about an hour before sharing our pieces and cleaning up. On March 8th, International Women’s Day, we exhibited some of the paintings at a vernissage where the women were given a space to share how they were affected by the workshops. Many expressed that painting was a way for them to recognize their achievements in a way that made them both visible and tangible, and that their pieces literally illustrated the progress they were making over time in their respective situations. Thus began my deep (and I presume life-long) admiration for art as a tool for personal and community development. 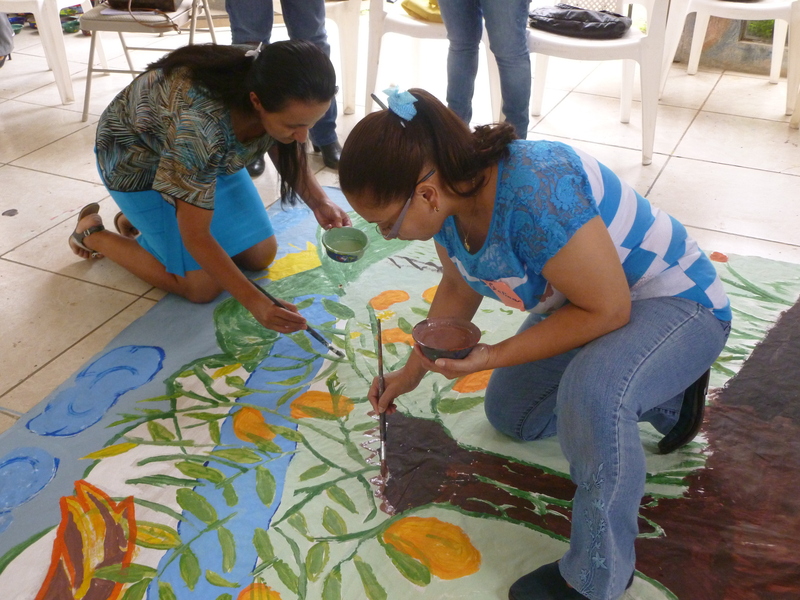 Primary school teachers paint in a FUNARTE workshop on sociability. The workshops I observed, facilitated, and participated in during my six months at FUNARTE have done everything to solidify my belief that arts-based learning holds a critical role within the realm of transformative education. Whatever their skills or stressors, the children, adolescents, and adults who are a part of FUNARTE’s projects demonstrate how artistic expression is a powerful strategy to cultivate pathways for self-sustainable development on all levels—individual, relational, and societal. Art is the eclectic platform used to advance a battery of foundational capacities based in creativity, sociability, and self-esteem, and I have seen through FUNARTE’s work how this leads to positive change in Estelí’s homes, schools, and communities. The end-of-year evaluations for both projects I worked on, “Arte y Cambio” and “Colores Primarios II­,” show that positive change is brought through higher levels of school success, engaged citizenship, positive health practices, and, among other factors, strengthened interpersonal relationships—all in the effort of promoting children and adolescents’ rights and their active participation in Nicaraguan society. Whether while painting a mural or doing a group collage, FUNARTE’s arts-based methodology is contagious in progress, creativity, and inspiration. 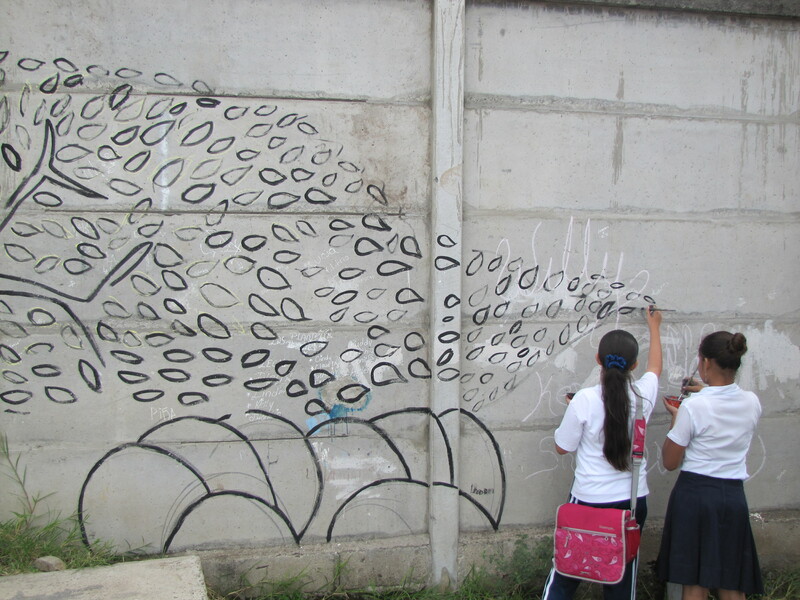 Grade 8 students prepare a school wall for a mural on environmental awareness. Estelí has been recognized as the City of Muralism by the Nicaraguan government, and, at the risk of sounding cliché, I can say after working with FUNARTE that the murals make it a beautiful city on the inside just as much as it does on the outside. The vibrant colours and positive messages of peace, respect, and justice surrounding children’s rights that fill FUNARTE’s public art pieces are a reflection of the positive values and attitudes that Estelí’s children, adolescents, parents, educators, Ministry of Education representatives, national police representatives, and many other community actors hold. 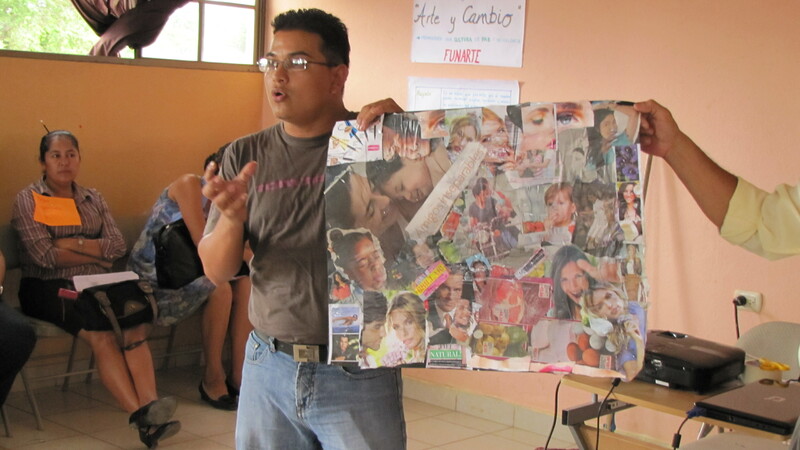 A high school psychologist explains the ideas behind his collage. A final note: In my last month with FUNARTE, I had the opportunity to create video presentations for both projects I worked on, “Arte y Cambio” and “Colores Primarios II.” Both include video footage, interviews, and photos of the different project activities—I hope you enjoy them! While six months may have seemed too short a time to be in Nicaragua, I am grateful that it was enough time to create friendships and memories that will last a lifetime. ¡Muchas gracias y buenas vibras a todos!